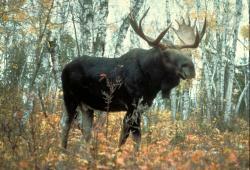 Fewer moose on the loose: Climate change is taking a toll on Minnesota's moose population, putting them in line to be added to the state's species with special concerns list.Courtesy USDA Forest ServiceWhile it's been a pretty good 16 years for Minnesota wolves and bald eagles, that's not been the case for moose. The behemoths will likely be moving on to the state's list of species with special concerns, according to the Minnesota Department of Natural Resources. In total, 67 animals and 114 plants are being proposed to be added to the lists while 15 plants and 14 animals – including wolves and bald eagles – have rebounded in numbers to be removed from the designations. Climate change is being credited as the big threat to Minnesota's moose population. Crying wolf about a wolf hunting season? Or are they valid concerns? Are you aiming at us? : This fall a limited wolf hunting season will be open in Minnesota. What do you think of that?Courtesy StefanWith their numbers now above endangered levels, this fall wolves will be among the species Minnesota hunters can legally take. The wolf hunting season will run concurrent with deer season in sections of northern Minnesota. A wolf trapping season will follow, starting on Jan. 1, 2013. 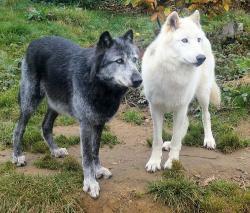 The new season will limit the take of wolves to 400 out of a state population estimated at about 3,000 wolves. Visitors at the Science Museum of Minnesota can weigh in on their thoughts about a wolf hunting season at the Science Buzz poll kiosk on Level 5. Currently, a strong majority of opinion is against the idea of hunting wolves. The Minnesota Department of Natural Resources conducted a similar online survey to gauge public opinion on a wolf hunting season...with 80 percent of respondents saying they were against the idea. But proponents of the hunting season say that survey was rigged with a huge anti hunt contingent of opinion coming in from outside of the state. You can read more about that survey here. Also, some Native American tribes in Minnesota aren't thrilled with the idea of a wolf hunting season. You can learn more about their thoughts on this issue here. What are your thoughts about a wolf hunting season restarting in Minnesota? Share your opinion here with Science Buzz readers. The Hawaiian monk seal, Monachus schauinslandi, is known to the Native Hawaiians as 'ilio-holo-i-ka-uaua', or "dog that runs in rough water". This endangered seal, along with the Hawaiian Hoary Bat, are the only mammals endemic to the Hawaiian Archipelago: they are found nowhere else in the world. Seals can be injured or killed by becoming entangled in marine debris. There are fewer than 1200 Hawaiian monk seals left in the wild. If you are lucky enough to see one on a beach or swimming, please keep your distance and do not disturb them: they are protected by both state and federal laws. We will keep a watchful eye over the next four years to make sure that science policy adheres to the agenda and principles that our new president has set out. So, how are things going so far? Last week, the White House released a new report on climate change. Roger Pielke Jr., professor of environmental studies at the University of Colorado, says the study is seriously flawed. He finds the report relies on data that is old, narrow, non-peer reviewed, second- and third-hand, and contradicted by more recent, peer-reviewed studies. He specifically objects to claims that global warming is leading to more natural disasters. Such disasters are Dr. Pielke’s specialty, and he argues there is no such trend. Back in February, Secretary of Energy Steven Chu said that global warming was going to destroy agriculture in California. Dr. Pielke (who is becoming something of a one-man band in reigning in the more outrageous claims of global warming) picked apart that one as well. In March, Interior Secretary Ken Salazar removed gray wolves in the northern Rockies from the Endangered Species list. This action was first proposed by President George W. Bush just before he left office, but suspended by the incoming administration. Two months later, they decided that Bush was right to accept the unanimous recommendation of Fish and Wildlife scientists. "We removed the High Bridge stack nest box after the 2007 nesting season. Xcel Energy was converting from a coal facility to natural gas turbine operation, and planned to raze the stack some time in early 2008. We installed a replacement nest box on the nearby ADM stackhouse, but it appears that the falcons chose to nest under the nearby High Bridge instead." All spring we watched and waited, and the birds were there all along! I'll get in touch with the folks at Xcel and Raptor Resource and see what we can do about watching the peregrines during the 2009 nesting season. Here's a report of a metro man facing a prison sentence after shooting a wolf in northern Minnesota while the animals were still catagorized as an endangered species. For the first time in 70 years, biologists have confirmed that a leatherback sea turtle has nested in Texas. Though they did not see the animal itself, the researchers found its unmistakable tracks and a freshly-dug nest. 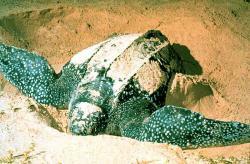 The leatherback, the largest reptile in the world, is endangered worldwide. Many drown when caught in fishermen’s nets. Poachers steal their eggs. Development encroaches on the sandy beaches the turtles need for their nests. The return of at least one turtle to Padre Island, Texas is hopeful sign that the species may be making a slow comeback. You can learn more about leatherbacks turtles here and here. Here's some interesting video about a problem in Chinese wildlife preserves: the sale of tiger bone wine, which some Chinese believe has medicinal benefits. Big trouble for a little animal: The federal government is studying if endangered status needs to be expanded for the pygmy rabbit, a little bunny that can be found in eight western U.S. states.Courtesy WikipediaDid you know there was such a thing as the pygmy rabbit? Neither did I until I ran into a news story today that the federal government is considering adding the creatures to the endangered species list. 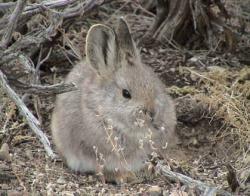 Pygmy rabbits have already hit endangered status in eastern Washington. Now, their numbers are looking to dip below that standard in other western states of California, Oregon, Nevada, Idaho, Montana, Wyoming and Utah. As their name implies, pygmy rabbits are small – just nine to 12 inches long and weighing just under a pound. They live in tall brush and dig down into soily burrows. They’re one of the few rabbit species that live in the ground. Why are their numbers going down? Human development is pushing out places for the little bunnies to live. Farming, fires, mining and recreational development have encroached on their habitats. For several years, researchers have spent millions trying to develop a breeding program to re-establish their numbers in eastern Washington. A population of 20 pygmies put into the area earlier this year has been reduced down to one lone rabbit due mainly to the munching habits of predators. Should these kinds of efforts continue or is this a lost cause? Share your thoughts about protecting threatened and endangered species here with other Science Buzz readers.